Did a quick update. Fixed the collar on the home. Changed the alt to tweaked version of the old Lady Liberty alt. The Islanders didn't make changes, no surprise there. For them I merged together some ideas taken from the classic look and their first design when Reebok took over. This is something I've had in mind for a while. I think it turned out well. As a fan, I'm a fan. All jokes aside, these jerseys are awesome. I'd buy those in a heartbeat. 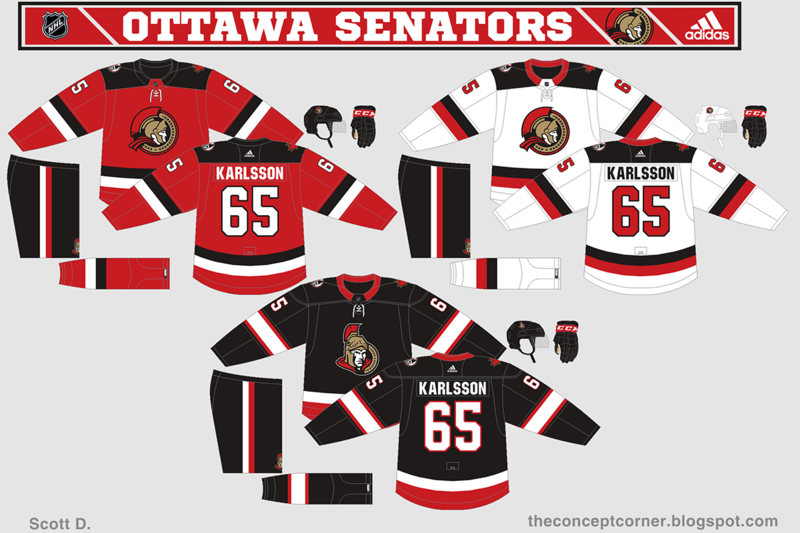 The current jerseys have nothing wrong with them, but if they were to change them, these would be my first choice. Just awesome work. Buffalo didn't really change much with the change over to Adidas. For them I decided to return to royal blue. 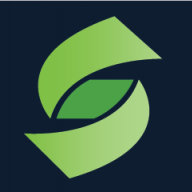 Merged together various elements in the new logo. Brought back (and tweaked) the alternate logo last seen on the Slug jerseys. I like that. I really love this uniform! 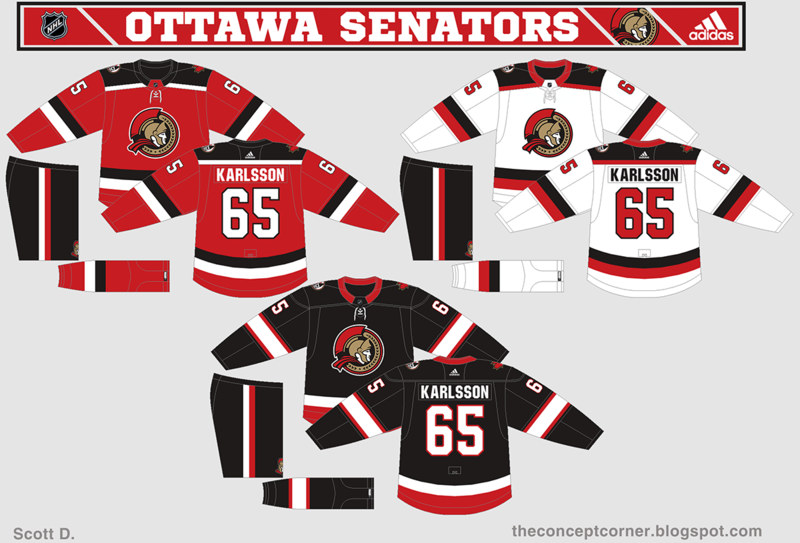 For the Senators based the primary off the heritage jersey. Alternate based on their inaugural look. I know the side facing logo is the superior, but having the alt based on their inaugural jersey and not use the logo that closest resembles the inaugural logo seems odd to me. And while the home and road look nice, the yokes make them look too much like the Devils. Great job. Just a little nitpick, I'd add a white outline to the logo. looking at it again, perhaps adding a single stripe to the yokes would help differentiate. So a thick white stripe on the home, thick red on the road. This would mimic the sleeve/hem striping and give a little more of a barberpole reference without being over the top. Made some slight changes. I know I forgot the helmets and gloves. Not much to say. Set is inspired by their past. With the Ducks reportedly going orange full time in the future. This set is based on what I hope they do. The two logos should be swapped the Mighty Duck is a far superior logo compared to the Webbed-D. Everything else looks great though. If I won a million dollars, I would buy every jersey you've made in this series. 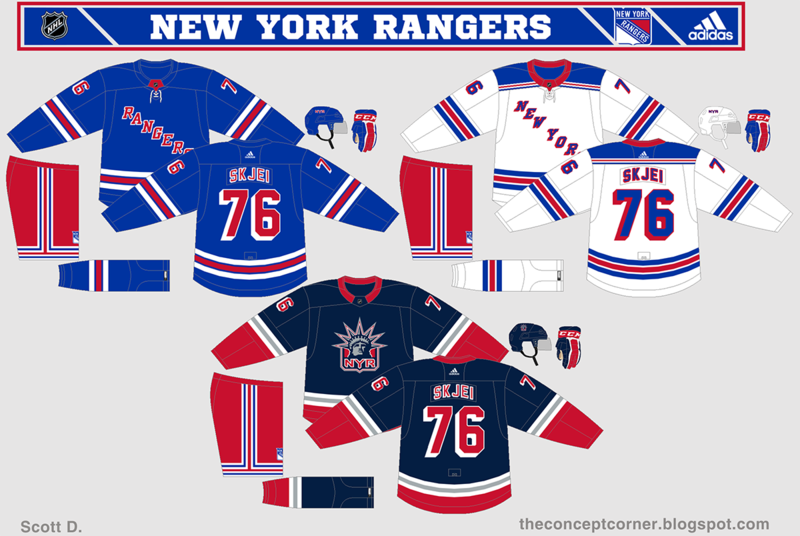 There's something sad about one guy's concepts on a fan forum for sports logos being so much better than the actual jerseys of most of the league. Not much to say. Set is inspired by an older concept I did some time ago. For the Penguins I decided to keep in line with their current look. While fixing the things about it that always bugged me. More consistency in the striping between both jerseys. 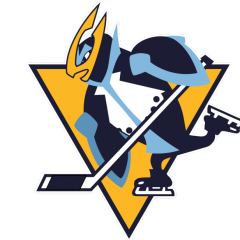 Also, the robo penguin logo returns to the shoulder. Although a slightly tweaked version of it. I think you need to have the pattern fully match on each jersey, maybe even keep the current away.